Watching Robert Altman’s 1980 motion picture adaptation of “Popeye,” you find yourself wondering what was it precisely that drew the director to the squinting, muttering cartoon character in the first place. It could just as well be that the one-eyed sailor evoked some similarities with other signature Altman characters. Popeye enters Altman’s film a wisecracking anti-hero thrust up against an all-consuming atmosphere of bizarre, claustrophobic rules, no less than Philip Marlowe in The Long Goodbye or Sutherland and Gould’s doctors in M*A*S*H. He’s a willful pacifist and reluctant (if effective) fighter, embraced of child-like innocence and dreams, and amidst the dilapidated ruins of Sweethaven he could as well be a Brewster McCloud or a Pinky Rose silhouetted against a bizarre local culture of eccentrics reminiscent as much of Nashville as anything. Of course, he just as likely took the project as handed to him by the studio, resulting in the sometimes muddled mix of Altman-esque trademark and evocative animated nostalgia. It’s a rough stormy sea that Popeye the Motion Picture sails. Producer Robert Evans and Altman reportedly repeatedly came near to blows backstage, an apt enough explanation for its financial failure and robust raspberries from the critical ranks. In 1980, though, the kids liked it — praise that’s rarely attributed to Altman’s oeuvre. 25 years of simmering has allowed the gossip to evaporate into trivia, and the sting of its devastating bombing raid on box offices from sea to shining sea to mellow. Add to this the almost constant rotation the movie’s enjoyed for the last several years on Comedy Central, HBO Family and a select few other cable outlets, and Popeye is being seen with new eyes (two apiece or one squinted, viewer’s choice) by an audience gradually turning into a rabid fanbase. Two and a half decades too late, to be sure, but it is the age of DVD after all. Adapting a comic strip as a motion picture musical is par for the course, following in the footsteps of Li’l Abner and the much-maligned Broadway musical It’s A Bird … It’s a Plane … It’s Superman, among others. Undoubtedly chief in the studio’s mind was the Broadway success of Annie, the all-singing, all-dancing, entirely-too-chipper paean to Depression-era plutocrats and the love in their hearts. Although Annie’s very successful film adaptation followed Popeye’s, it preceded the sailor’s big-screen debut in its Broadway incarnation by three years. 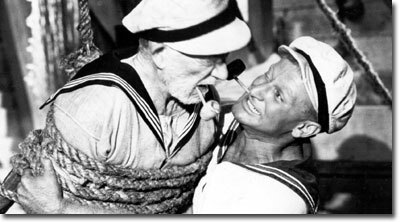 What Popeye had that Annie didn’t was music by Harry Nilsson, providing a strangely wistful series of songs for the film, generally sung awkwardly and with half-whispering absence of confidence, as well as an excess of self-consciousness on behalf of the actors. And while Annie was painted in large strokes which captured only the roughest idea of a Little Orphan and the Depression, and very few specific notes which were any more reminiscent of the source material than that, Popeye had Jules Feiffer. As respected in his field as cartoonists get, Feiffer also brought with him some experience as a lauded playwright and an abiding love for the creation of E. C. Segar. Where the film succeeds 25 years after the fact is Feiffer’s charming depth of affection for the characters, and the way it underlines Altman’s signature exploration of all-too-human eccentricities against this cartoon background. While Feiffer’s screenplay mines rich veins from Elzie Segar’s source material, the film is also informed visually and thematically by the animated films of Max and Dave Fleischer, from the affectations of Olive Oyl’s nasally voice to Popeye’s between-scene muttering. The film opens with the Flesicher studio-style, black-and-white ship’s deck against a stormy sea, Popeye’s familiar animated likeness popping up from below deck to ask, “What’s this, one of Bluto’s tricks?” before declaring, “I’m in the wrong movie.” That’s called handing one to the critics. The live-action portion of the film opens on those stormy seas, Popeye’s fragile dinghy buffeted by dark waves. He finds safe harbor in the port of Sweethaven, until he’s assaulted by the overzealous and comically officious Tax Collector, working on behalf of the unseen Commodore. Popeye rambles on into a ramshackle city seemingly built on stilts and well on its way towards tumbling into the water, itself a set which borrows visually from the cartoons rather than the comic strip. In Segar’s “Thimble Theater” — precursor to Popeye’s eponymous run in the comic strips — the neighborhoods and towns inhabited by the Oyl Family and their many acquaintances and enemies resembled nothing more than sparse suburbs and lone bungalows seen over gently rolling hills in distant backgrounds. Popeye enters Sweethaven to find a fully formed cast. We’ve already seen Bill Irwin as Ham Gravy, Olive’s original beau from the “Thimble Theater” strips, reduced here to a wordless but awe-inspiring slapstick performance. Wellington J. Wimpy, a relative latecomer to the strip, wanders the streets of Sweethaven in an endless search for his dual joys of hamburgers and bilking poor strangers, while his nemesis Geezil awaits Popeye at the vegetable stand up the lane. Popeye took the stage of “Thimble Theater” well into its run, one of a cast headed by Ham, Olive and her brother Castor Oyl, the hero. Popeye appeared on January 17, 1928, hired to captain Castor, his sister and her boyfriend, as well as their lucky Whiffle Hen, to break the bank at Dice Island. He started his comic strip career with appropriate sass. Originally a throwaway character Segar intended to abandon, it’s clear that Segar — along with a vocal population among his readers — came to love the one-eyed sailor. At the end of the Dice Island arc, Popeye had taken fifteen bullets in the course of protecting Castor and his fortune, and swabbed the deck with the sinister Jack Snape. With the exception of Olive — whose permanence in the mythos of the strip is assured by her expert damsel-in-distressing in multiple generations of “Popeye” cartoons ’ the eldest cast members of the strip become the most background cast members of the film. Olive’s brother and their parents are supporting characters several tiers down the hierarchy, the cantankerous father Cole reduced to a shtick gag, demanding apologies for slights both perceived and real. By the time he’s introduced these characters, Altman finds one of his wide open spaces in the film, in the home of the Oyls where Popeye has taken residence as a boarder. A complicated dinner scene evokes nothing less than the dialogue and distaff personalities of a hyperactive Tennessee Williams play where laconic has been traded for lunatic. Altman’s direction evokes the mania of M*A*S*H, the close angles and claustrophobic framing generating Segar’s frantic confusion and eccentric mishap while remaining visually distinct from the source material. While the veterans of the strip have diminished roles as the movie unfolds, the relative latecomers hold sway. Chief among them is Bluto, here the Brutus to the unseen Commodore’s Caesar (appropriately enough, given that the character was introduced in the cartoons first, and renamed Brutus when brought into the strip many years later) and Olive’s current fiancée. 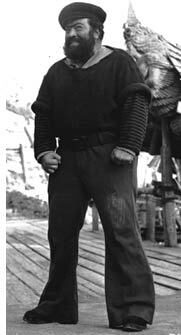 The cartoons influenced the storyline, as Bluto was a villain of the Fleischer cartoons and was grandfathered into future animated efforts. Eluding inclusion into the film were more stalwart and serial villains of the strip, particularly the wicked Sea Hag of whom even stout-hearted Popeye is deathly afraid. The Sea Hag rather famously ignited the imagination of Segar and many of his readers, but never did make the successful transition to the cartoons, a medium where four high-pitched miniature Popeye clone nephews sprung fully formed in quadruplicate were rapidly embraced by the viewing public but a murderous, green-skinned pirate crone apparently strained credulity. Segar and Norton S. Parker, a contemporary pulp writer and avid fan of Segar’s creations, collaborated on a blood-soaked and chilling novel pitting Popeye against the insidious Hag. The final product never materialized, but the few available passages paint a picture so dire and gruesome that it would either have been too intense for children or so savagely neutered as to fail to merit the attempt to adapt it. Wimpy also displays less than his full catalog of wiles in Altman’s Popeye. In the original Segar strips — and even in the cartoons — he was a po-faced and self-assured con man of almost supernatural powers. The original J. Wellington's deliberate antics drove hash-house proprietor Rough House and Wimpy’s archnemesis Geezil into states of near suicidal vexation; he even once successfully wooed the Sea Hag into near matrimonial complacency. Even the Bruiser Boys — perennial albeit largely anonymous tough guy antagonists in the “Thimble Theater” and “Popeye” strips — make an appearance in Rough House’s restaurant, dispatched in one of the surprisingly few fight scenes of the entire film. (Dennis Franz makes an appearance as the never-mentioned-by-name Spike. It’s amusing to imagine this as a short and slightly anagramized nickname for Sipowicz, making this the weirdest crossover ever.) Feiffer’s appreciable knowledge extends even to Popeye unleashing his patented “Twisker Sock,” winding his massive forearm into a spinning juggernaut of violence. This scene, the brawl with the Bruiser Boys at Rough House’s diner, is one of the two where the directing and the story are most faithful to the source material. Feiffer’s script evokes the stalwart and reticent Popeye, whose formidable fisticuffs were left largely unleashed during the greater portion of his first appearance in “Thimble Theater.” It takes the Bruiser Boys prodding mercilessly before Popeye’s pushed to raucous recriminations (and even then, it takes the further abuses of the Bruisers on innocent patrons and much-put-upon Ham Gravy to spur the hero to action) and Altman’s direction approaches the mania of the cartoons. The scene is bursting at the seams with cameos by virtually every civilian character Feiffer could draw from the strips, shy of Eugene the Jeep and Alice the Goon. It pays to remember that Popeye is a sympathetic character, more than a monocular mass of muscle driven to spinach-fueled fits of pique. “I’m only a common sailor,” he said in 1928, “But I got a soul. I gots sensitivity.” Popeye is, after all, a passionate pursuer of Olive Oyl’s affection and a father figure to, depending on the source material in question, a passel of pop-eyed nephews or the orphan Swee’pea. There was a tradition in the comic strip involving mysterious boxes shipped from strange locations, containing anything from Castor’s loyal and unkillable Whiffle Hen to the strange, magical critter Eugene, a rare beast known as a Jeep (whose popularity within the strip gave the army vehicle its name). Swee’pea — the infant crown prince of the distant nation of Demonia, as far as the strips ever informed us — also arrived by way of one of these mysterious boxes. Feiffer introduces him by way of the proverbial basket, possibly since an unmarked box stuffed with gurgling baby might raise more questions than could be answered in a movie otherwise packed with wordplay, music and conflict. Swee’pea appears in the film as Olive makes repeated aborted attempts to run away from her engagement party to the “large” Bluto. This is the final component necessary to push the story forward, and for most diehard fans of the comic strips or cartoons it’s where it begins to lose its focus. Understandably misunderstanding the sight of his fiancée and a strange sailor showing up at the door to his engagement party with a small baby in tow (an evocative gag intended for the adult audience, to be sure), Bluto’s vengeance begins with knocking Popeye down a gangplank to the street below. (Popeye is represented by a stuffed, fabric mannequin bent into a wheel shape, in what I have to admit is probably the single most visceral memory ever embedded in my young subconscious. I had nightmares about puppety, rolling scarecrows for years.) His subsequent vengeance involves bankrupting the Oyls with excessive taxes. From there, Castor Oyl makes an effort to reclaim the family’s good fortunes by taking a paid challenge against the formidable boxer Oxblood Oxheart, in a scene greatly reminiscent of a similar boxing match within the comic strip between Popeye and “Jack the Zipper,” a fight in which Swee’pea also not only gets involved, but during which the little shaver takes more than a few punches on his own. In short order, Swee’pea’s predilection for precognizance is unveiled (evoking a short-lived storyline in the comic strip), followed by Swee’pea’s abduction, the introduction of Pappy Poopdeck (Popeye’s irascible and long-lost father) and a battle on the high seas involving an octopus and our hero’s first snootful of spinach. Along the way, Popeye also does a song and dance with a bunch of whores. Audiences in 1980 were — and some continue to be today, if a brief and informal survey of film review websites is to be any indicator — largely turned off of the film version of Popeye owing to what they felt was an incongruous marriage of Altman’s political sensibility and the smash-’em-up high spirits of the Fleischer cartoons. It was not as though they believed that goon carcasses launched offscreen by whirling mitts, twenty at a time, was somehow utterly incompatible with any political parody or sentiment: they simply didn’t see it happening with their Popeye. It’s that “Popeye” which Altman and Feiffer ignored, and the cantankerous and irrepressible precedent which they embraced. Altman’s recurrent themes of the eccentric individual versus an effectively insane and inhumane power structure were the backbone of the film. Feiffer made of Sweethaven what Segar had created decades earlier in his comic strip nation of Nazilia (later Nasilia, though no less obvious a swipe). Ruled by cowardly, brutal tyrants under arbitrary, absurd rules, it’s an earnest, financially impoverished yet fiercely independent psychological anarchist who imposes his own meaningful order, to the benefit of all whose paths he crosses. In the end, whatever likely studio demands were made of him, it’s this element of Segar’s famous sailor which must have spoken directly to Altman’s sensibilities, and which Feiffer so lovingly evoked with all the robustness available in a feature film necessarily pausing for musical numbers. The Fleischer films made a shibboleth of the sentiment first uttered by Segar’s sailor in the panels of “Thimble Theater”: “I yam what I yam,” which ultimately is as fine a summary for Altman’s film version as there can be: It is what it is, and that’s all that it is.